Juno ardiente. 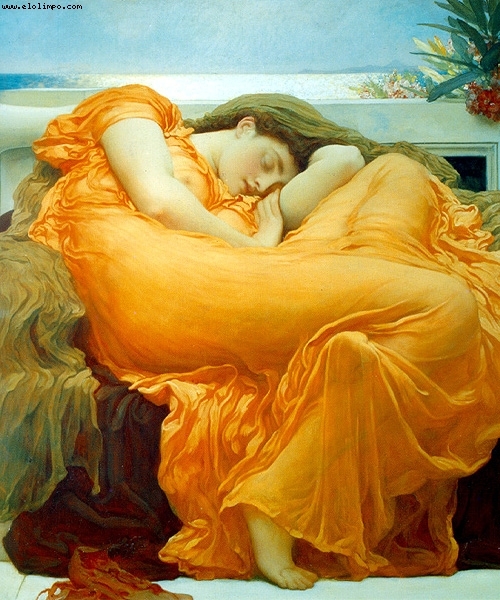 Although Lord Leighton of Stretton is more properly considered a neo-classicist and, as Rossetti said of him, "was wholly opposed to their (i.e., the Pre-Raphaelite credo of art) views", this painting reflects a strong Pre-Raphaelite influence, both in form, content, and execution, despite Leighton's imaginary posthumous denunciations to the contrary. "Flaming June" (46x46 inches) now resides in the Museo de Arte de Ponce, Puerto Rico. First exhibited at the Royal Academy in 1895. There is a crayon study for this painting at Leighton House; at least one other is known. The design of the picture was first intended as a decorative bas-relief for the marble bath on which the figure in his "Summer Studies" reclines. Leighton was suffering from his last illness while painting this picture, and he died in the following year. "Flaming June" was on loan to the Ashmolean between 1915 and 1930, but apparently disappeared. It was not publicly known again until its rediscovery in 1963. It is a delightful painting and owes much to the ground breaking work of the Pre-Raphaelites. ... Interestingly, one of Lord Leighton's most significant paintings is that of his companion Dorothy Dene, who later became a stage actress. She was an uneducated Cockney girl who modeled for the high-living Victorian bachelor in London.